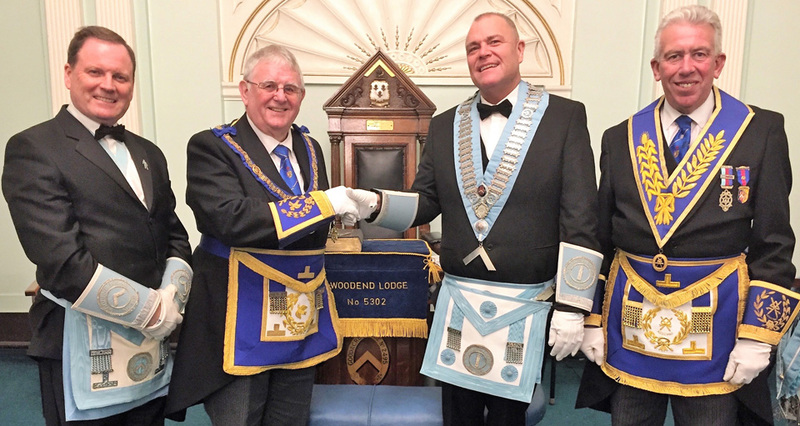 Following closely on the tail of George Christie and Derek Evans, Ed Tucker has been installed as the third master of the amalgamated Woodend Epworth Lodge No 5381. The ceremony took place in the upstairs Adams Suite of the Liverpool Masonic Hall. The principal guest on the evening was Assistant Provincial Grand Master John Stuart Seddon, along with Liverpool Group Chairman Mark Matthews and Provincial Assistant Grand Standard bearer Steve Owen from the Leigh Group. Steve was only appointed at the Provincial meeting in Blackpool. There was one master in office, John Bruffell of Temple Lodge No 1094, brother to the lodge director of ceremonies. 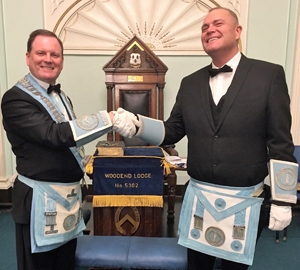 On commencement of the ceremony, the master elect Edward Tucker was presented and being a first-time master, the full ceremony was used, as he was installed in fine style by Derek Evans. Following this, Edward’s first duty was to invest Derek as the immediate past master. Robert Ledger then presented and explained the working tools of the third degree, Tim Evans for the second, whilst those of the first degree were presented in an innovative style, being split between entered apprentices Eric Texon and Jinky Mariano. After the officers for the forthcoming year had been invested, the address to the master was delivered by Ray Moorcroft, while John Leisk in his usual exemplary manner, addressed the wardens. As is customary, it was the principal guest Stuart Seddon, who gave the address to the brethren of the lodge. Edward’s first task was to present three cheques to Stuart on behalf of the lodge; one to the Liverpool Masonic Charity for £100, the second to the Liverpool Masonic Hall Building Fund for £100, and £250 to the MCF 2021 Festival. The lodge throughout the evening showed how a ceremony could be shared amongst its members and make them all feel involved. The installing master lead the way, hardly needing a prompt all evening. On completion of the installation, the lodge was closed in due form, with the members and their guests retiring for the festive board, which consisted of a Chinese buffet. Prior to sitting down to the meal, Stuart took the opportunity to toast the new WM and thanked immediate past master Derek Evans for the way he installed his successor and DC David Bruffell for the able manner in which he ran the lodge ceremonial. In response to the toast to grand officers, John had the delight of responding. He thanked the lodge again for their charitable donations, whereupon he expanded on this theme, explaining much of the good work that went on and the indispensable help it afforded to those in need, both Masonic and non-Masonic. When he sat down after his reply, the response of those present was a natural one of warm acclamation. As the evening progressed, WM Edward Tucker was presented with a congratulatory card on behalf of the Liverpool Group. Edward also presented each of the two principal guests, Stuart Seddon and Mark Matthews, with a bottle of spirits, prior to their departure. Pictured from left to right, are: Derek Evans, John Stuart Seddon, Edward Tucker and Mark Matthews.